Happy Halloween, everyone! I know all of you probably got all of your celebrating out of the way this weekend, but because today is the actual holiday I’m going to make it this post’s theme. Every year Halloween costumes become more and more creative, ridiculous or lame depending on who you are. 3. Writing the word “book” on your face. Facebook. “GET IT?” Yes. I get it. Since we talk about trends on this here blog, it’s important to point out that I’m a big fan of “timely” costumes. For example, dressing as “The One Percent.” You can be pretty creative there. 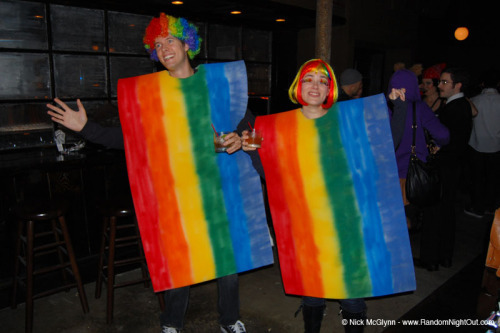 My favorite costumes this year followed the “Hallow-Meme” trend. A meme, for all you late bloomers, is an image, video, phrase or idea that gains popularity in a “viral” manner through the Interwebs. In New York City, they even have a Hallow-Meme party that gets more and more guests each year. My favorite idea for a good meme to make costumes of? The Double Rainbow. Bring a friend. One you should probably avoid, however, would be the College Freshman meme. Especially if you’re actually a college freshman. So if two weekend nights (or three, or four, depending on how you personally define your weekend) weren’t enough Halloween fun for you and you want to dress up tonight on the real holiday, why not dress as a meme? Perhaps a LOL Cat or a Foul Bachelor Frog? All the cool kids (or maybe just the ones who spend way too much time on the Internet, like me) will understand your costume. Hipster cred, my friends. Hipster cred.